A brand new Nottingham skate plaza has been awarded a near perfect score by the national Considerate Constructors Scheme (CCS). The new £80,000 facility on King Edward Park in St Ann’s was completed in early December 2016 for Nottingham City Council (NCC), thanks to WREN funding. Site manager, Paul Cross, and his team of sub contractors were visited by a Considerate Constructors monitor in November, who commended them for delivering an ‘exemplary’ scheme. 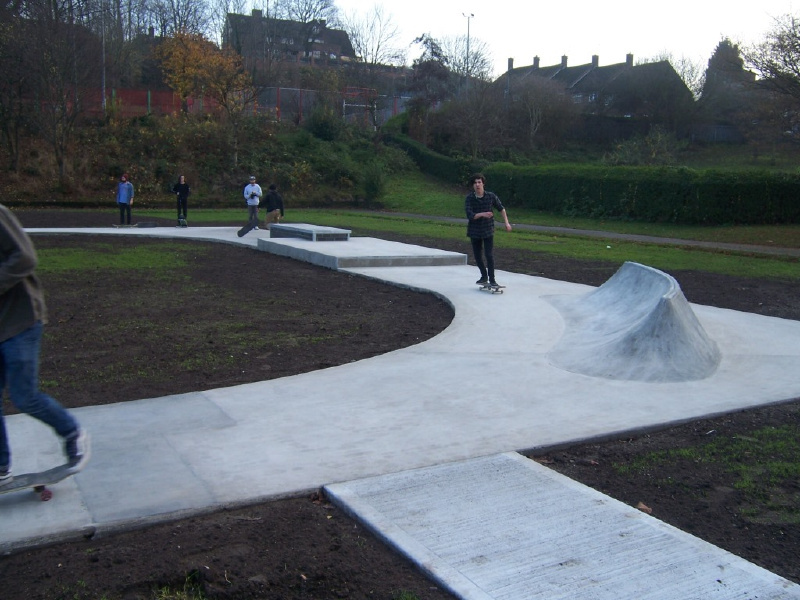 The CCS Scheme awarded King Edward Skate Park 47 out of 50, which is Woodhead’s highest ever score. With a national average in November 2016 of 35.42, this score places the project in the top 1% in the country! Woodhead and NCC developed plans for the plaza in collaboration with community skateboarding organisation, Skate Nottingham and specialist skatepark design firm, CANVAS. Throughout the project Woodhead has engaged widely with the local community, inviting the nearby Carlton Digby School to site, allowing students to learn more about the project. The team also visited the school with representatives from Skate Nottingham, who taught students some new skills and donated skateboards to be used in the future. The site team, local residents and students from Carlton Digby School also collectively placed items of significance into a time capsule, which was buried under the skate plaza, commemorated with a plaque installed on the side of the structure. Members of the local tenants and residents association were regular visitors to the site, and the Woodhead team has supported them in a range of local improvement works, such as installing remote control PIR lighting, painting the toilets in the community centre, donating topsoil and the site’s netting to the community garden and installing it securely. The team also converted their smoking shelter into a community noticeboard on leaving the site. Each area is marked out of ten, with top scores achieving an ‘innovative’ title. In two of the five areas – Respect the community and Value their workforce – King Edward Skate Park was highlighted as ‘innovate’ (10/10), with the remaining three sections marked as ‘exceptional’ (9/10). Last year Woodhead achieved a score of 45 out of 50 on another site for Nottingham City Council and Nottingham City Homes, at Denton Green in Broxtowe. This achievement subsequently resulted in a Gold Award at the annual CCS Awards, with the site being named Most Considerate Site in the country (under £500k). Cllr Dave Trimble, Portfolio Holder for Leisure and Culture at NCC, said: “The work that’s gone into creating this brand new community facility is fantastic, and I’m delighted to say it has already been used by a range of skateboarding enthusiasts. The council worked with East Midlands Property Alliance (empa) to appoint Woodhead, through its dedicated framework. Managed by Scape Group, empa aims to improve the delivery of construction projects and property maintenance for public sector bodies, saving them and the taxpayer money. Ian Towlson, Regional Frameworks Manager for empa, said: “By engaging the local community through school visits and the time capsule scheme, Woodhead has delivered a project that will have a real and lasting impact on its end users, so it seems fitting that this has been recognised by the CCS Scheme.